Bent Run Waterfall and Hector Run Waterfall are both located within the Allegheny National Forest. They offer stunning views of Mother Nature’s creativity. Located along Rt. 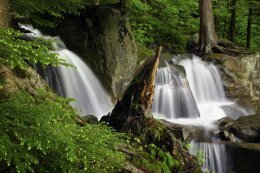 59, in the Allegheny National Forest, this waterfall is especially beautiful during the spring. The waters flow especially well during heavy rains and spring run-off, but the flow can dwindle down to a trickle during a dry summer. Access is from a small parking lot at a bend in the road, close to the eastern edge of the Kinzua Dam parking lot. Bent Run is a short hike, full of nooks and crannies and easy climbing. A strange geologic formation surrounds this waterfall. 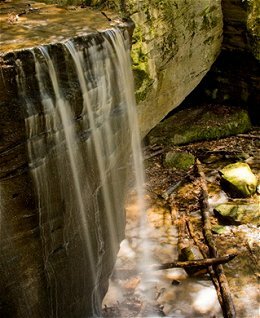 Having a height of only approximately 22 feet, the waterfall is set amidst a collection of large boulders. The waterfall plummets from a rectangular shaped rock face and has a lost world type of feel. When water levels are high, the water flows off two different faces, when water levels are low the flow goes down to a trickle. Parking for the falls is located about two miles down a dirt road, which starts in the town of Ludlow, Pennsylvania, along Route 6 in McKean County. It is a difficult trek, as explorers will be in remote forest, with little signs of human habitat, and very limited signage. Use a GPS unit with the coordinates of 41.6853 -78.975067 to guide you to the falls.